Over the past few years, Bristol City Council has been doing a lot of work to improve the quality of life for people living with dementia. Their aim is to create a city where people with any level of dementia are valued for who they are and are able to live full, involved and creative lives. We want them to continue to enjoy the things they have always done, and go out and discover new things to do. They believe that it is essential for people to be physically active, and people living with dementia need the same opportunities as everyone else, as sports and other activities have shown to have a positive effect on their general health and wellbeing. They have been working with pool operators Parkwood Leisure and Everyone Active, with help from the ASA, to start to create a swimming project across the city which welcomes people with dementia to swim independently, with friends, families or carers, at any time that is convenient to them. 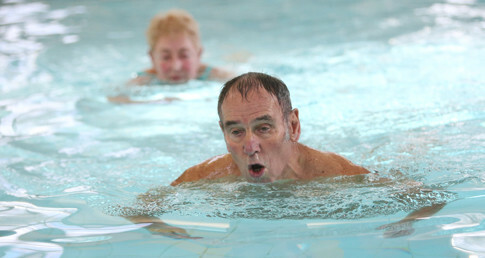 Currently two pools are offering our Dementia Friendly Swimming, but long-term they hope to roll it out city-wide. They are gradually training the poolside and front-of-house staff so that they understand more about dementia and how it might affect people who come to swim, and looking at the centres themselves, to see how we can make them easier to navigate. At Hengrove Park in south Bristol, there are now have dementia friendly swim sessions on Wednesday lunchtimes. If you would like to join, come along to reception at 12.45 to meet the swim leaders. They will show you the quickest route into the changing rooms and the pool. They will join you in the swim session and invite you for a chat in the café with the group afterwards. Cameron Bate, General Manager of Easton Leisure Centre located near the city centre commented, “We pride ourselves on being a friendly community-orientated leisure centre, where our colleagues are always willing to help you. We offer great service to keep you active and enjoying every visit. We want people with dementia to feel comfortable here, alongside everyone else, so we are working on making the centre dementia friendly. For more information please contact Gill Brookman, Public Health, Bristol City Council gill.brookman@bristol.gov.uk or Kevin Chong, Bristol & Avon Chinese Women’s Group IT.bacwg@btconnect.com.